Hello to all who came to read my new review. This time I watched a new horror movie A QUIET PLACE, so I want to share with you my insights about this beautiful, just a perfect horror movie. I began to wait for this John Krasinski movie a month ago, although I knew about this movie from the time when the film was started filming. I was not fascinated by either the presentation of the idea itself or the first anons, which also caused a lot of questions regarding the logic of the storyline. However, when I first saw the reactions of well-known American film bloggers, cinematographers, and critics I was easily shocked. The film received the highest ratings and was compared to the best horror movies of all time. Therefore, believe me, it was really difficult to wait for the premiere in Lithuania, because curiosity did not give peace every time when it came to another positive evaluation of the film. So, sometimes you need to make sure you watch the full movie yourself, rather than rely on some kind of flair after watched the anons of the movie or after reading the description of the film. The actor and scriptwriter John Krasinsky presented one of the most unique and promising movies, a thriller full of tension and horror elements that can transform the horror genre for many years. What do we often think of when it comes to the modern genre of thriller or horror movie? A lot of blood, cruelty. Perhaps still open end, leading to another series. Speaking of our senses, many may also mention the scream that sometimes leads to a headache, especially if you are in the cinema. 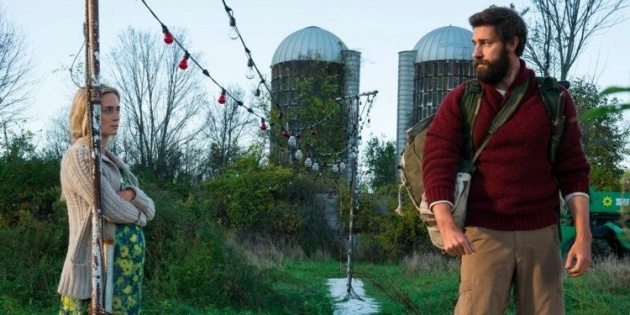 In the new horror movie A QUIET PLACE, there is also a sound, but the tension is caused by silence, turning it into a special and probably one of the most memorable examples of horror thriller movie genre in recent years. Let's start with an alert for popcorns. If you plan to carry a regular portion of the popcorns to A QUIET PLACE movie review, be aware that you will hear every crack. This is because most of the great movie is performed in complete silence. It's a movie about a world where sound costs your life. 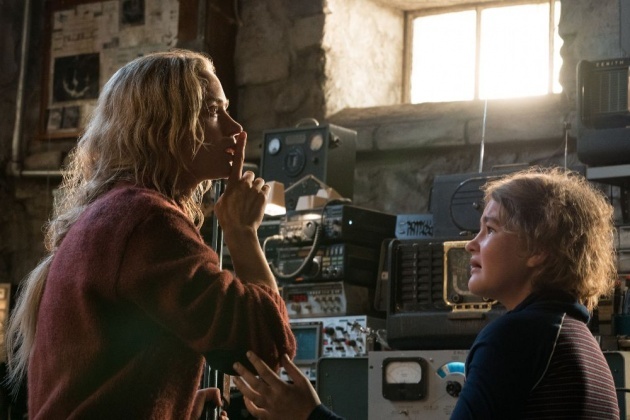 A QUIET PLACE tells about the Lee and Evelyn Abbotts family that seeks for the surviving in post-apocalyptic America. It turns out that the Earth was full of extremely dangerous monsters destroying most of humanity. The only imperfection of these creatures is that they are completely blind. The absence of this sensation they compensate with a very sensitive hearing. So one carelessly released sound means a near-guaranteed death. Therefore, Lee and his pregnant wife Evelyn, along with her children, Regan and Marcus are forced to live in almost complete silence. The family is doing well, but because of a couple of life-threatening accidents, the monsters perceived where is the living place of the family. In this situation, the story of survival, family, and the new baby's coming into a damaged world is starting to take place with a rather short, clear but emotional charge. Characters have created a special gesture system so they do not have to talk. The only way to survive is not to make any noise, but how do you reach it in the house where the children are? All family members must adhere to many rules, of which the main thing - in no way cause even the slightest noise, which can cost them life. At the beginning of the movie, the monster crushed the disobedient little brother, but after a fairly long time lapse, parents and their two children still cannot cope with the pain of loss and feelings of guilt. Evelyn's (Emily Blunt) pregnancy adds even more stress to the movie. Observing the totally silent family's daily life - food producing with no use of any electric appliances, played table games with soft figures and music listening through the headphones - the natural question arises: how do the newborn will manage to come to this world without sound? The birth of a child is full of pain and stress, and here it becomes even more complicated - you cannot even scream! And how, in the end, they will succeed in ensuring that the newborn will not cry? Not to mention the fact that every day, Li and Evelin fear that the unintentional sound would not end with the tragedy. What could be worse for the feeling that they cannot protect their children? At first glance, it may turn out that the director is not about to distance himself from the genre's tradition. The Abbott family lives in a closed space - their far-off village looks like a living island in the territory terrorized by the monsters of an uncertain origin. This area shrinks even further when the family moved from the home to the basement so that the sounds are as less as possible. 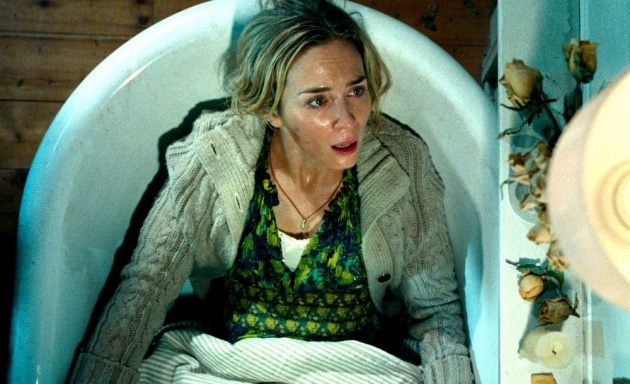 There is a lot of darkness in A QUIET PLACE, without which horror films are also unimaginable. One can envy John Krasinski's clarity of idea: the monsters do not see, they react only to sound. So the horror of the movie increases with every sound because it can be fatal. As a result, film actors walk barefoot on sandy tracks, use plant leaves instead of dishes, and talk by gestures. The stress is also that the daughter of Regan hearing aid can not really help to orient in the space. John Krasinski also uses this motif perfectly, occasionally allowing us to listen to what the girl is listening to while developing the subject of the hearing aid until the final of the movie. By the way, all the themes are developed consistently up to the end - when the movie is over, you realize that there was no unnecessary motive or detail. Would it be possible to live in complete silence? The entire storyline, as well as the logic of the movie, revolves around the silence. The silence here is not only the main tool of survival, but it is also a great tool for the director to build and strengthen the already tense situations. The watchers have not been released since the very first minutes of the movie when the real situation of the Abbott family is not yet clear. Later, in the film, silence becomes a mean to play with tension, moving it from one character to another, thus creating a just stinging atmosphere. First of all, what I really liked was the overall presentation of the atmosphere. It is a rather silent movie, which requires enough high concentration in order to feel the fear that each of the main heroes of this band lives in. Therefore, watching this movie, you must respect not only yourself, the creators of the film, but also other people. At least, forget the snacks during the session, because, believe me, at least the slightest sound can damage the view not only for you but also for your neighbors sitting next to you. Second - intrigue. Until the end of the band, it's simply not possible to predict how this film will end, and who is really the main evil here. Interestingly, the film focuses on a small place on earth, and we do not know anything about the rest of the world. That's why it's really interesting to wait for the movie to end and possibly find out what's really going on in the world and why people are forced to live in a complete silence and feel a fear of their lives. The story somewhat reminded of a very good 2016 thriller 10 Cloverfield Lane. Those who have seen it will really understand what the principle I write about. The third and no less important accent of the film is the great use of scare opportunities. And I say this because other projects in the horror genres are tending to a certain point until everything goes wrong, and then something happens. Most often, such cheap horror tricks try to frighten a trusted spectator who has acquired an immune watching a wide range of horror films for many years. But just not here. The essence of the whole movie here is silence, so when and what is unexpectedly coming out, it's very hard to predict. It creates a fearsome and extremely frightful atmosphere. Sometimes silence can be a much better horror tool than repetitive noisy sounds not surprising anymore. I was scared not only because of the brilliant and tense atmosphere but also because of the heroes. They are fantastic here. Through their prism, we can feel the horror spreading out of the film, which stimulates all sorts of feelings, from despair to the real fear. I'm not kidding, I am a strong nervous viewer who is extremely rare frightened, but during this session of the movie, I've felt real tension several times. Talking about the heroes, they are all unique because of the very good presentation of the human prism, through their fears. Each character reveals himself in a rather interesting way, so creating their psychological portraits will not cause big problems. We can sympathize with them and worry about them because they are human and too close to us. These are not idiots who make stupid decisions or heroes who are able to stand in an equivalent fight with monsters, but the people able to fight their own personal demons and the outside world that they see through their fears. To sit for one and a half hour as on the needles was a truly worthwhile challenge that is worth all 100 percent. This film is not only a great horror genre project but also a completely new benchmark for this extremely popular movie genre, proving that ideas are still alive in a Hollywood. The film is captivating not only with an excellent script and a good director's vision to frighten the viewer but also with several technical solutions that were able to create a unique atmosphere for the plot. To mention these technical moments, I would like to note the minimalist environment and decorations that make it possible to see the reality of the Abbott family that looks very horrible. Also, the natural color palette chosen by the creators of the film has given a special charm. It was precisely because of the natural image the one could feel the feeling of reality, which also added a big plus to this movie. Music and sound montage here are worthy of applause. It was really impressive and a bloody fighting. And the end ... I will not comment on anything here, but the final sound's montage was so perfect that I thought that from this sound the heart would stop. For the sound alone, this movie must only be seen in the cinema and anywhere else. I was pleased with a camera work also. The terrifying looking environment and the emotions poured freely, and through them, the film has become scarier and much more realistic. The viewer is almost always tense, even in quieter scenes he feels a strange tension. All this is contributed by the very good camera work, which reveals not only the deceptive idyll of the American village but also the tension that vibrates when it's needed. The video editing is also without reproaches. The one-and-a-half hour tense story did not stumble at the presentation of the storyline. The intrigue has been kept to the fullest, and the secret is revealed later than it would be desirable. This combination does not allow you to breathe, so the review becomes very special. The work of an actor deserves only a good word. The whole story told in the film is very strongly localized, and we almost do not see strangers there (except the one rather tragic scene). Some people may not like it - after all, humanity is like cockroaches, they always remain, and they always hurt each other. However, in my opinion, the decision to limit movie to only one family is not only logical but also correct. Why? First, why there should always be groups of communities or bad people that terrorize good ones who are seeking for surviving in post-apocalyptic thriller or horror films? The strongly localized mini story requires more effort from the main actors in the film. There is not really a big complain about the work of the actors. 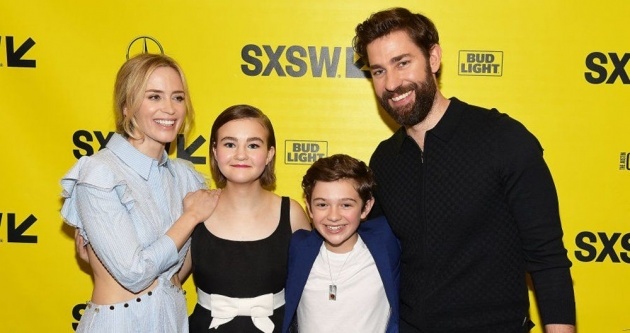 It is possible to point out the good connection between John Krasinski and Emily Blunt (probably due to the fact that they are spouses in reality), as well as the efforts of the acting young actress Regan, Millicent Simmonds. The viewer should support every actor in the film, which certainly cannot be said about many movies of this genre. Film director John Krasinski not only wrote a script for this film, produced it, but also played a key role. And he did it perfectly, the actor showed his potential as a drama actor. Emily Blunt plays the main woman in the film. She, as always, has been great and committed to her role, capable of conveying fear, joy, love, and anxiety in a single scene without saying a word. It was really nice to watch the performance of this "Golden Globe" actress and sympathize her character. The actors of the second plan: Hollywood actor Noah Juppe well-known and promising actor of the young generation, and Millicent Simmonds, a newcomer to the cinema. These young actors brought a lot of energy in the film, and most interestingly, there were a few such important scenes that I personally struggled to deal with. Personally, I am not a big fan of horror movies, but I really enjoy the good films of this genre where dominate not only violence or ghosts but which contain at least some original and not a banal-looking idea, or at least it has a unique presentation that made it possible to feel a strong fear. 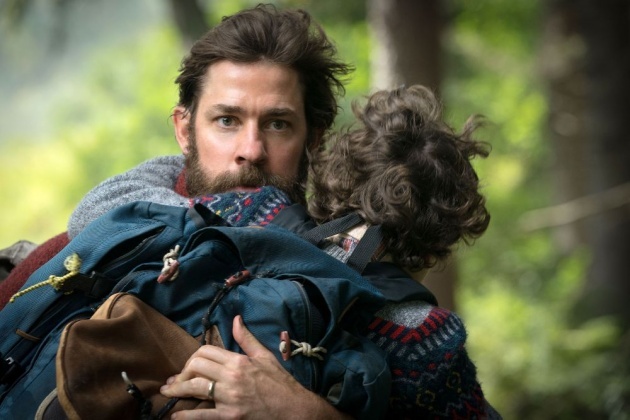 John Krasinski shows parents who love their children and sacrifice for them. Shows children who perceive that they will become, if necessary, the protectors or carers of a mother and other family members. Shows how parents should keep in mind their love when talking to children. After all, he shows the dedication of parents, because, in almost a silent film, the most laud phrase is the wife's shout for a husband: "We have to protect them!" It's just a well-created thriller that stands out of the causing boredom sea of movies. A clear story, a great game of tension and a good overall idea makes the movie worth attention of all the fans of tension movies. And, of course, it is one of the most enjoyable surprises this year, to which is worth to devote one and a half hour in the cinema. 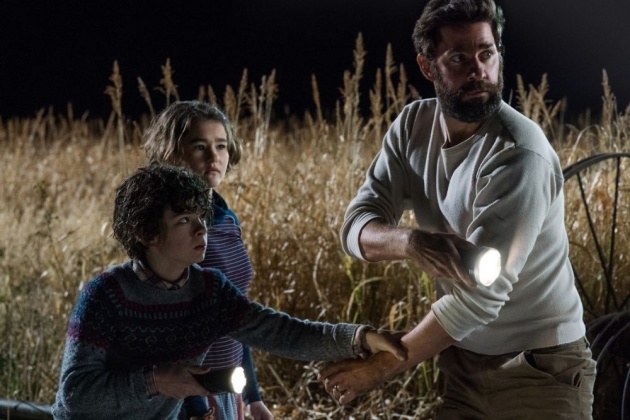 A QUIET PLACE is an excellent horror thriller by the logical development of the plot line, and due to its unique looking foundation, is very scaring and keeping the watchers in an unceasing tension that lasts for 90 minutes.The movie also astonishing by its extremely realistic presentation of history, able to affect the watcher emotionally through many factors of human fear. I want to say that this movie is worth every good word that any person has ever said about it. It does not matter whether it's a film critic or a regular film visitor. It's not just a movie, it's a unique and breathtaking journey into the most intimidating world of a single family, which makes us feel uncomfortable, observing every single well thought out the turn of the storyline. 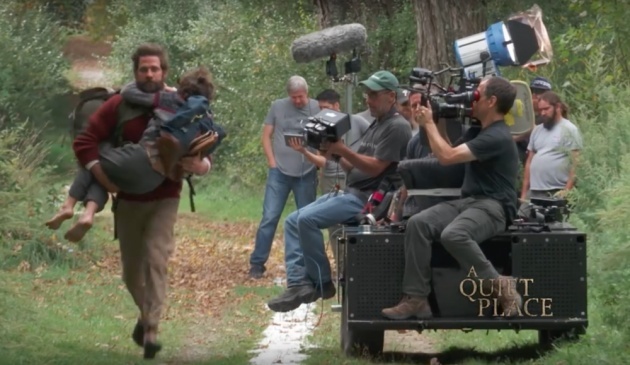 You can ask where the commentary of reality lies in A QUIET PLACE movie? It seems to me that John Krasinsky formulates it clearly: the future will not be easy, but all monsters are more and more often able to easily destroy the normal world and intimidate people, and the only solution is the family: its solidarity, closeness, not expecting anything from others, trusting themselves only. Only it can help defeat not only the monsters but also the world. 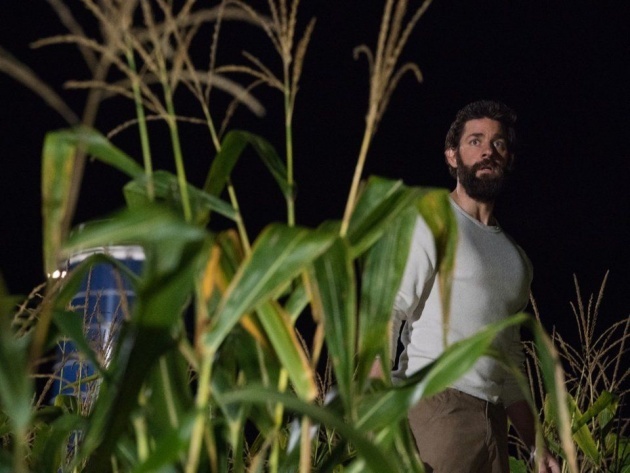 Personally, this movie has become one of the best ever seen horror movies that really managed to scare me very well and, undoubtedly, is the most original genre project over many years, for which we should be grateful to John Krasinski. I like Emily Blunt allot. This movie sounds scary.